An innovative Lichfield company is proving that ‘Business is Good for Britain’ after launching a pioneering PR and marketing drive designed to raise awareness of childcare vouchers. BusyBees Benefits, which employs 24 people in the City, has beaten off competition from across the region to secure ‘Marketing Campaign of the Year’ (sponsored by the RBS Group) in the West Midlands Chamber Awards 2012. It has developed and successfully launched the ‘Mind the Gap - Raise the Cap’ campaign that explains to parents how they could sacrifice money from their salary in exchange for childcare vouchers. The leading provider of employer and employee benefits has used a mix of media relations, advertising and social media to reach as many potential users as possible. Busy Bees, which is a member of the Birmingham Chamber of Commerce Group, has enjoyed an increase in the profile of the business and secured 9000 signatures for its e-petition, which calls for the Government to raise the current cap from £55 to £75 per week. President of the British Chambers of Commerce Martyn Pellew said: “There has never been a more important time for businesses to showcase the amazing work they are doing on a day-to-day basis. TheBritish Chambers of Commerce (BCC) Chamber Awards 2012 is committed to finding the best businesses in Britain through a series of regional heats followed by a National Final, due to be held at London’s Guildhall on November 29th. Now in its 9th year, the competition is one of the showcase events for the ‘Business is Good for Britain’ campaign that highlights the role of business as a positive force for the UK recovery and the success of local communities and individuals. BusyBees Benefits is one of eight regional winners in the West Midlands, who will now go forward and compete for the national titles in their respective categories. All will have a chance to win ‘Outstanding Business Achievement’ and a £25,000 cash prize courtesy of the RBS Group. 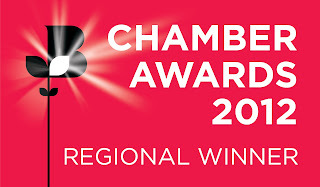 The Chamber Awards 2012 is supported by the RBS Group, BT Business, Dell, DHL Express, Westfield Health and Acua Limited. Peter Ibbetson, Chairman of Small Business Banking for RBS and NatWest said: "I'd like to congratulate all of the award winners on their achievements. We wanted to sponsor this award as, at a time when all businesses are dealing with difficult economic conditions, marketing for your business becomes even more of a priority and a key part of business success. “As a bank we're keen to help all businesses meet their ambitions and it's important to celebrate this type of success along the way."